632 pages | 12 B/W Illus. This detailed handbook covers different chromatographic analysis techniques and chromatographic data for compounds found in air, water, and soil, and sludge. 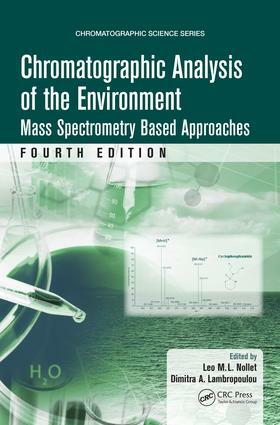 The new edition outlines developments relevant to environmental analysis, especially when using chromatographic mass spectrometric techniques. It addresses new issues, new lines of discussion, and new findings, and develops in greater detail the aspects related to chromatographic analysis in the environment. It also includes different analytical methodologies, addresses instrumental aspects, and outlines conclusions and perspectives for the future. Leo M.L. Nollet, PhD, is an editor and associate editor of numerous books. He edited all three editions of Food Analysis by HPLC and Handbook of Food Analysis, as well as co-edited Safety Analysis of Foods of Animal Origin and Sensory Analysis of Foods of Animal Origin. Dimitra Lambropoulou, PhD, is assistant professor of Environmental Chemistry in the Environmental Pollution Control Laboratory, Department of Chemistry at Aristotle University of Thessaloniki. She coedited the book Transformation Products of Emerging Contaminants in the Environment: Analysis, Processes, Occurrence, Effects and Risks.